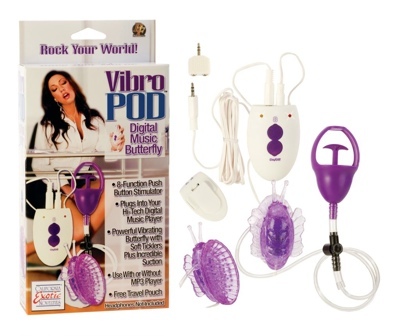 Vibro Pod Digital Music Butterfly Pump SE000420. Feel the beat! Vibro Pod Digital Music Vibe may be used independently or with your MP3 player. Soft Rubber-Cote vibe dances to 8 functions of vibration, pulsation, and escalation. Includes extra long cord, handy travel pouch, and a convenient clothing clip. Vibrating butterfly clitoral pump with soft ticklers. Powerful sucking action. Easy-to-use trigger pump. Flexible air hose. Purge valve. Made using phthalate free, non-toxic materials: ABS plastic with Rubber Polyurethane Cote controller, soft Thermoplastic Resin TPR butterfly. 2 AAA batteries, not included. Butterfly measures 3 inches long by 1.75 inches wide. Stimulator measures 3 inches long by 2.75 inches wide. California Exotic Novelties Catalog. Please note this item has been discontinued and quantities are limited.